Back Pain and Aches in Muscles and Bones, Cervical Stiffness, Sprains, Injuries due to over use of muscles. Arnica: After traumatic injuries, overuse of any organ, strains. Traumatism of grief, remorse or sudden realization of financial loss.Joints as if sprained. anything he rest upon feels hard. Formica Rufa: Muscles feel strained and torn from their attachment. Weakness of lower extremities. Dulcamara: feet icy cold. Perspiration on palms of hands. Pain in shin-bones. Rhus tox: Rhus affects fibrous tissue markedly-joints, tendons. Actae Racemosa: Shooting and throbbing pains in head after mental worry, over-study,Heavy, aching, tensive pain. Ruta Graveolens: It is wondeful 1st Aid treatment for sprains, injuries, strain, bruises bones, pulled ligaments. Acts in Sprains or fractures that aren't healing well. Description Also known as R 5, R05, R 05 Properties FormDrops Weight69 (gms) Dimensions3 (cm) x 3 (cm) x 9 (cm) R5 GASTREU - STOMACH DROPS Indications of Dr. ReckewegR5 Acute and chronic gastritis, dyspepsia, chronic relapsing gastritis with or without ulceration. Especially ulcus parapyloricum. Heartburn, bad taste in mouth, frequent belching, flatulence, meteorism. Acts on the inflamed mucosa of stomach, on the physiology of stomach. Ingredients of Dr. ReckewegR5 Anacardium Argentum nitricum Arsenicum album Carbo vegetabilis Chelidonium Lycopodium Nux Vomica Scrophularia Nodosa Mode of Action of Main Ingredients in Dr. ReckewegR5 Anacardium: Gastric complaints, improving after eating, pains around midnight. Argentum nitricum: Epigastric complaints, noisy and frequent belching with temporary improvement. Arsenicum album: Remedy for mucous membrane, burning pain in the stomach with vomiting. Carbo vegetabilis: Sensation of repletion in abdominal cavity, asthenia and exhaustion. Chamomilla: Nervous hypersensitivity and irritability. Swelling of the stomach. Chelidonium: Effective for liver and bile, choleretic, improvement of gastric disorder by ingestion. Lycopodium: Gastro-intestinal disturbances, bitter taste in mouth, lack of appetite, constipation, flatulent colic. Nux vomica: Nervous irritability, hypochondria, stomach constriction, disturbances due to nicotin. Scrophularia nodosa: Griping pains in abdomen, hyperacidity improving after eating. In some patients, sensitive to drugs, the pains may grow worse after a few days of treatment, which is the socalled primary reaction. In such cases it will be advisable to discontinue the treatment completely for 1-2 days. Resumption of treatment will result in continued improvement. In other cases follow treatment with intermissions, or reduce the dose, or give the drops on a full stomach. 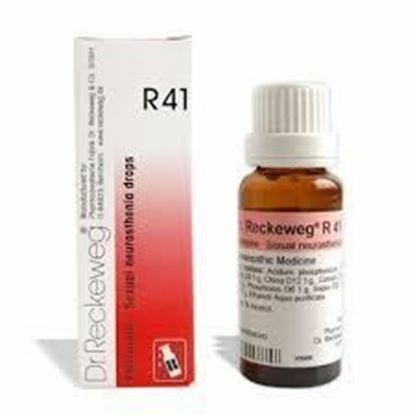 It is characteristic in the use of Dr. Reckeweg R5, to see the usual relapses decrease progressively in graveness and frequency, until they disappear completely. 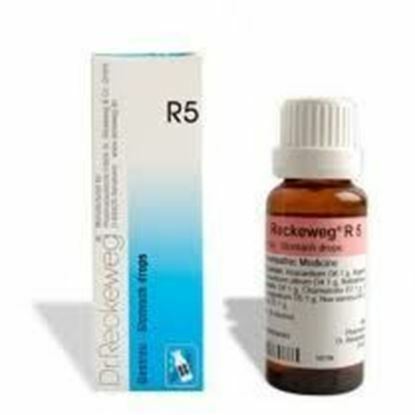 Dosage of Dr. ReckewegR5 Generally 3 times a day 10-15 drops in some water before meals. After complete disappearance of the symptoms, in order to prevent relapses and to regularize the neuro-vegetative system, once a day 10-15 drops in some water before the main meal. Description Also known as R 8, R08, R 08 Properties FormSyrup Weight302 (gms) Dimensions5.2 (cm) x 5.2 (cm) x 14.5 (cm) Indications of Dr. Reckeweg R8 Catarrhal affections of the upper air passages. Rhinolaryngopharyngitis, especially bronchitis and whooping cough at all stages. 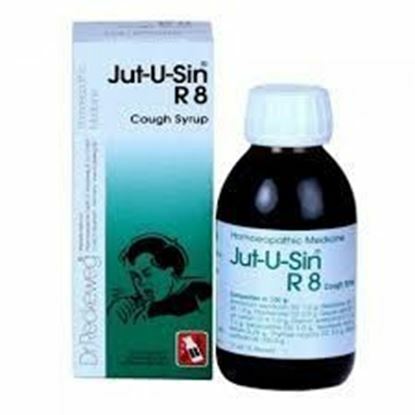 Effective expectorant in chronic bronchitis, bronchial asthma, fits of coughing in phthisis. Mode of Action of Main Ingredients in Dr. Reckeweg R8 Ammonium causticum: Convulsive cough accompanied by plenty of loose mucus. Belladonna: Convulsive cough attack, hollow and barking cough, dry mucus membranes. Bryonia: Harsh and dry cough with pain in the chest. Chamomilla: Convulsive cough,catarrh and hoarseness with accumulation of tenacious mucus in the throat,dry cough,chiefly in the evening and at night. Coccus cacti: Hypersensitivity of the mucosa of the pharynx. Spasmodic cough with viscous glairy expectorations. Corallium rubrum: Violent attack of convulsic cough with choking fit. Cuprum aceticum: Spasmodic cough, viscous mucus, dyspnea. Drosera: Convulsive cough with cyanosis and suffocation, spasmodic asthma. Ipecacuanha: Dry asphyxiant cough with glottis spasm, nausea and emesia. Spongia: Hollow cough, cough at night. Sticta pulm: Cold down from the nose to the pharynx and trachea, followed by bronchitis. Pressure on the root of the nose. Thymus vulg: Expectorant. Dosage of Dr. Reckeweg R8 Whooping cough: In the beginning of the treatment frequent doses, every 1 hour 10 drops in some water, or one teaspoon (5ml) of syrup. Advisable is, to alternate from hour to hour the cough syrup and the cough drops. After attenuation of the graveness and frequency of the fits of coughing (generally in 2-3 days) take the medicine every 2 hours. 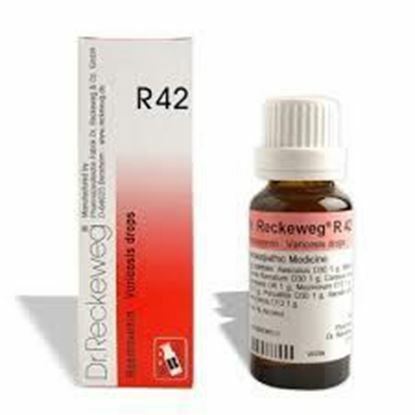 In the treatment of non-specific catarrhs, following whooping cough, take 4-6 times daily 10-15 drops of Dr. ReckewegR8 in some water, or one teaspoon (5ml) of syrup. Acute bronchitis and laryngo-pharyngitis: Every 2-3 hours 10-15 drops or one teaspoon of syrup.